Simplot Ignite is being run in partnership with corporate accelerator, Slingshot, and is part of Simplot’s efforts to disrupt itself by supporting external business ideas that could add or transform its customer value proposition and product set. The first round of the program attracted 87 applicants, 30 of which were invited to pitch their ideas in early February. Five startups and three scale-ups were chosen and will now be put through a three-month intensive mentoring program in order to build up their ideas. Each startup winner receives $30,000 in seed funding, while the scale-up organisations will have access to Simplot resources, mentoring and coaching from industry experts, and also gains access to products and services provided by Slingshot’s strategic partners and sponsors. All eight will be given the opportunity to present their ideas to investors as well as Simplot executives, and the food manufacturer is hopeful of striking potential commercial agreements with one or more long-term such as an equity stake, partnership or distribution rights. Simplot is also assigning subject matter experts from its own teams to these applicants along the way to better understand their ideas and ways of working, and to ensure alignment. Chief marketing and digital officer, Fiona Allen, told CMO applicants needed to address one of the main business themes Simplot has identified as an organisation. One such opportunity in the retail area is nutrigenomics, or the study of food on genes in order to understand an individual’s potential risk of future diseases or illnesses, then prevent these through nutritional plans. “That connection of genetics with technology, food and health and bringing them together creates meaningful engagement with consumers,” Allen said. Other strategic themes include convenience as it relates to food, and horticulture. All of these business priorities have been identified by Simplot as key to delivering on its 2020 vision and are around emerging and disruptive ideas. “It’s about how we continually disrupt and reinvent ourselves to make sure we’re relevant,” Allen said. The five startup winners selected are: ChewsR, an app that uses appealing food images instead of written menus to help decide what to eat; Danny Burrito, a share economy concept for utilising existing but idle commercial kitchen resources; Athletes Gift, a hyper-personalised nutrition guide for individuals; The Virtual Nutrition Clinic, which aims to reduce the time, cost and location barriers for people wanting to access personalised nutrition; and Yummed.com, a social networking platform based around shared dining experience. The three scale-up winners are: Hum Technologies, which aims to streamline and build efficiency for small businesses operating in Australia’s food sector; Low Carb Living Group, a business focused on tapping into rising demand for low-carb and sugar-free products; and Yello, also described as the ‘Uber’ of food delivery. 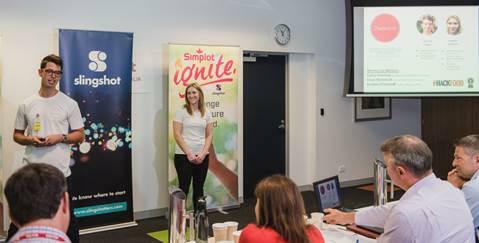 Allen said the Simplot Ignite program is part of a broader digital transformation approach being enacted across the organisation that covers three key areas: Hygiene, differentiation, and transformation. Already, the organisation is embracing more innovative principles and startup sciences such as design-led thinking and experimentation to shake up the way it goes about producing products and services, as well as building digital capability, all with the aim improving its innovation velocity and producing quality outcomes. Allen acknowledged this is a new concept for Simplot, but pointed out it also reduces risk for the company in many ways. The three-month mentoring phase kicks off in mid-March and runs through to May. This will be followed by a demonstration day where startups deliver a final pitch on their business model.